The Kaduna State chapter of the All Progressives Congress has reacted to a directive from the national body that the indefinite suspension of a senator, Shehu Sani, be lifted. In a statement on Sunday, the state chapter of the party said the lawmaker, representing Kaduna Central, remains suspended as the national body cannot impose a member on them. Earlier in the day, the national headquarters of the APC in a statement lifted the ‘purported’ suspension of Mr Sani. The Sunday statement signed by Salisu Wusono, the Assistant Publicity Secretary of Kaduna APC re-affirmed the indefinite suspension of Mr Sani. “The Kaduna State APC will not sacrifice its cohesion, discipline and unity for political expediency,” the statement reads “We have waged a long and consistent struggle to uphold respect for the Party, its constitution, and party spirit so that this party can grow and fulfil the hopes that inspired its formation. The statement went ahead to list offences for which the party meted out the indefinite suspension. The senator was accused of working against the progress of the party and the state in connivance with another senator, Suleiman Hunkuyi. “Article 21A (i-xi) of the APC Constitution lists offences for which a member is liable to disciplinary action. Shehu Sani has violated several of these, before and since his suspension. “We are not a party of anything goes! Shehu Sani is on indefinite suspension from the APC. The process for his suspension was initiated in December 2015 by the Party Executive in Ward 6, Kaduna South Local Government, which suspended him for 11 months. Shehu Sani’s indiscipline, his disrespect for the APC, and the whole notion of party spiritpersisted during the first suspension. Therefore it was extended to indefinite suspension, with the endorsement of the State Executive Committee of the party. 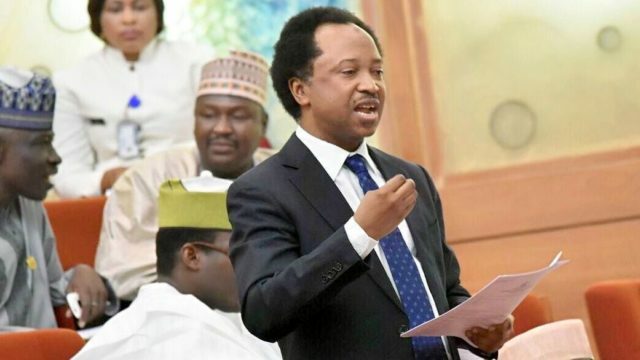 “Since 2015, Shehu Sani has engaged in unremitting hostility to the APC, joining the gang-up against the party in the Senate. At the national level, the utterances in which he has ridiculed the party and President Buhari are well-chronicled. “In Kaduna State, Shehu Sani has since July 2015 opposed everything the APC and the government it installed has tried to do. On Security, Education, Law and Order, and Social Welfare issues, he shamelessly diverged from party position with an enthusiasm and recklessness that even the opposition parties in the state did not demonstrate. We recall the undisguised glee with which he denied Kaduna State the $350m loan the World Bank had adjudged the state eminently qualified to access. This loan was to help improve lives by building more schools, hospitals and vital infrastructure. We cannot sit with such a renegade except he can reverse course and ensure that we get our loan, among other conditions. “While on suspension, Shehu Sani joined Suleiman Othman Hunkuyi in an attempt to factionalise the APC in Kaduna, opening a parallel secretariat and claiming to have their own chairman. The Kaduna State APC swiftly defeated this attempt at factionalisation. We were dismayed that rather than promptlyapplying the provisions of the party constitution to punish factionalisation, the national headquarters of the party constituted a “fact-finding” committee. The party called on the national leadership to uphold the party constitution in handling the issue. The stance of the Kaduna APC reflects the deep-rooted animosity between Mr Sani and the state governor, Mr El-Rufai. Both men, although members of the APC, have been at loggerheads since 2015, shortly after they were inaugurated. Due to their seemingly irreconciable differences, Mr Sani had been expected to leave the party. He was, however, persuaded not to by national leaders of the party.